Warning: This review contains full spoilers! I have also written a spoiler-free review, though. I intended to get this review up much sooner, but I think I needed to let the book sink in a little. I still can’t believe the Wheel of Time is over! A Memory of Light is everything I wanted, although it might not have been everything I expected. All my questions were not answered – some were, but there are bigger things going on, and it feels right. I don’t want to regurgitate the rest of my general thoughts beyond that – see the spoiler free review for those. I have so much to say, but I’m not quite sure where to start, so I’ll start with Rand vs. the Dark One. In hindsight, there’s no other way it could have ended. 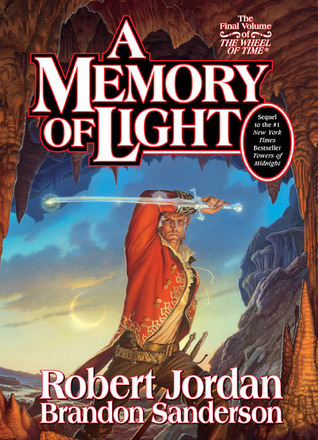 I was hoping that Rand would find a final way to defeat the Dark One (probably because my background in programming has really made me hate infinite loops), but the Wheel of Time’s metaphysics and theme has always been about the balance between two opposing forces, so it makes total sense that Rand realises that the Dark One is necessary to balance the Creator. I assume that the “three shall become one” prophecy refers to the combination of saidar, saidin and the True Power to reseal the Dark One – I’m really glad that the fan theory of Min, Elayne and Aviendha combining to become “Ilyena” did not come to fruition. The Rand/Moridin switching bodies thing was foreshadowed a long time ago (“to live you must die”), and it’s the only way the Dragon could disappear entirely, so I wasn’t too surprised. I thought that Perrin’s arc had a really satisfying end – all the lessons he’s been learning throughout the book really helped. I didn’t expect that he would basically fight in Tel’aran’rhiod the entire book, and I certainly didn’t expect him to be the one to kill Lanfear (although, again, it makes sense, since she’s the Daughter of the Night and he’s the most experienced with Tel’aran’rhiod). I especially loved the end, where he goes looking for Faile – their relationship is really the most important thing to him, and it made a great ending. And now we come to Mat. I’m not really sure how I feel about his and Tuon’s relationship – Tuon was a lot nicer when she was travelling with Valan Luca’s circus. I’d feel sorry for Mat, but he seems to like living on the edge, so whatever. He starts off commanding one Seanchan regiment, but of course, by the end, he’s commanding the Armies of the Light after some deft maneuvering by the Shadow that got rid of the Great Captains. I bet the Shadow thought they were doing themselves a favour, but they didn’t count on Mat and his foxhead medallion rendering him incorruptible. He also manages to get Tuon pregnant and win the respect of the whole Seanchan army, so he’s pretty busy. Oh, and he defeats Mashadar/Padan Fain/Mordeth. Apparently his brush with the Shadar Logoth dagger has left him Mashadar-vaccinated, so yeah. All I have to say is: I love Mat. So, this was much more of a war novel than I anticipated. It feels right – any less battling would have made Tarmon Gai’don seem too easy – this way, we truly feel the horror and despair of battle without the usual shortcut of killing off half the main characters. I thought it was very well executed – we’re used to our main characters being completely badass, and we see them get slowly overwhelmed despite all their resources and all their strength. Not that characters don’t die – Egwene is the only one of the main trio, though. And against all odds, Lan survives! (Although, I knew he had to because of Min’s vision of his kid.) Anyway, back to Egwene. I was really surprised by her death – she’s the one that has the most to do after the battle, reforming the Aes Sedai. She had so many plans that were barely coming to fruition – the integration of the Kin, the Aiel-Sea Folk-Aes Sedai alliance, the opening of the novice book. I don’t really like Egwene, but I do admire her, so I was pretty sad. She certainly went out in style, though, taking out Taim and all the Sharan channelers, and inventing the opposite of balefire to restore the Pattern (again, the theme of two opposing powers in balance). Her bonding of Leilwin was also a nice touch – that’s definitely not how I expected her help to go. Speaking of the Sharan channelers – I totally saw that one coming! I knew Demandred had to be in Shara (although Rand’s reaction to the Murandian king Roedran not being Demandred was pretty great) – it was interested that he was seen as their own prophecised hero. I wonder if Rand had made it to Shara whether he would’ve fulfilled those prophecies? Demandred was definitely formidable, though – killing Gawyn, disfiguring and nearly killing Galad, but finally falling to Lan. I’m used to the Forsaken falling easily, so it made a nice change. Although, I’m not quite sure why Demandred kept calling for Rand to face him – wouldn’t he know that Rand would be heading to Shayol Ghul to battle the Dark One? Gawyn’s death was pointless, but Gawyn seems to have made a habit of doing pointless things. I read his story a lot differently now that I know how it ends – it’s always been a tragedy. This actually makes me like him a little better. The saddest death was definitely Bela’s, though. Although, Rhuarc’s comes pretty close, considering what happens to him beforehand. Min’s story did not go where I expected it to go. I guess I didn’t really expect it to go anywhere – I figured she’d just provide support to the forces of the Light, but her becoming Tuon’s Truthspeaker was a completely unexpected twist. It fits with the Seanchan obsession with omens, as well as their imperial disregard for people’s wishes, though. I’m glad that that happened – along with Mat’s influence, and Tuon and Egwene’s conversation about allowing free speech in each other’s lands, this really sets up the stage for the end of damane and hopefully da’covale. (I hope Tuon will hold to the free speech idea now that Egwene is dead, the Seanchan don’t really have a history of keeping their promises). I think Min can hold her own very well against Tuon, and I wish I could read more about her adventures. Some of my favorite moments – Annoura burning herself out to deliver Galad to Berelain, the moment between Egwene and Rand before the Last Battle, Androl creating gateways into the lava within Dragonmount, Olver blowing the Horn of Valere (one of the best parts! ), Birgitte’s return to save Elayne (yay, Birgitte is still around! ), and the magical undying army of Hinderstap. I thought that sequence was kind of pointless in Towers of Midnight, but I didn’t count on Mat’s military ingenuity. Also, pretty much everything to do with Gaul was awesome. I knew the Aiel were brave, but Gaul took it to a whole new level, entering a realm that he had no power in and no conception of to watch over his friend. I can’t help but wonder how the Fourth Age is going to go. Perrin is Lord of the Two Rivers, and Faile is the Queen of Saldaea – how will that work? Cadsuane as Amyrlin? The poor Aes Sedai. And Logain building the Black Tower back up as a force of good – the moment where he realises where his glory will come from was priceless. 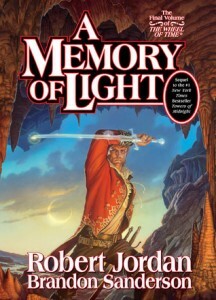 If you’re interested in this, too, there are a couple of awesome articles on Tor.com about the Fourth Age – Brandon Sanderson giving some answers on future events, and some speculation on the fate of the world after the Last Battle. This entry was posted in Books, Reviews and tagged book 14, fantasy, fiction, wheel of time by Kriti Godey. Bookmark the permalink.